Hi There! I subscribe to a lot of the fashion and beauty magazine and they all advertise this particular product call, Micellar water. So, I ask myself what is the heck is this micellar water and how will it benefit me? May of you might be asking as same think. Hence, to find out I did some research and this is what I came up with. Micellar water takes its name from micelles, tiny round balls of cleansing molecules that float in the water. According to board-certified dermatologist Hadley King of Skinney Medspa, “micelles are attracted to dirt and oil, so they are able to draw out impurities without drying out the skin,” rather than containing a foamy solution that strips your skin and leaves behind harsh chemicals. As a result, micellar water can be used as a facial wash, makeup remover and moisturizer all in one that leaves behind a glowy, hydrated finish. According to the Elle Magazine, micellar water has been around for hundreds of years, first gaining momentum in France, where it was designed to help Parisians deal with the region’s infamously harsh water supply. How is it different from regular cleanser? Micellar water is different from your traditional cleanser in that does not need to applied and than removed. All you need is to simply pour a little product on a cotton pad, then wipe your skin clean — and it feels delightfully refreshing. It another word, it is a dream product for any lazy girl like myself. It is great for people with dry and sensitive skin types because it is so gentle and hydrating. What will Micellar water not take care of? According to Huffington post, what micellar water won’t do, however, is remove heavy foundations or stubborn eye makeup like waterproof mascara. So you’ll need to use a separate makeup remover to get fresh-faced. Additionally, if you have oily skin, according to Tabasum Mir, a skincare physician in cosmetic dermatology and cosmetic laser surgery, this product doesn’t clean as well as you’d like. So she suggests those with oily skin, as well as individuals who are acne prone to supplement with a traditional facial cleanser. What are some the best micellar water out there? Some of the best micellar water that are available includes, La Roche-Posay Physiological Micellar Solution ($21); Perricone Blue Plasma Cleansing Treatment ($39);Bioderma Crealine H2O ($28); SimpleCleansing Micellar Water ($6.99). 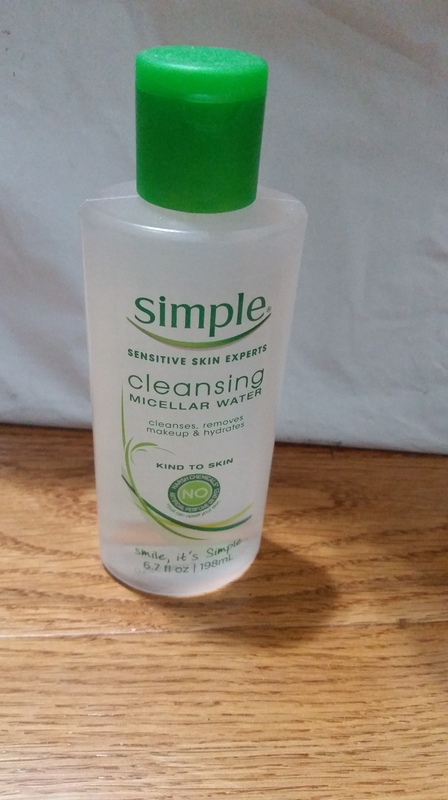 My favorite as always been the simple micellar water. I have been using it was a while now and I am in love with the product. I hope you find this article informative. Please comment on your favorite micellar water. Don’t forget to like my Facebook Page and follow me on Instagram @allaboutme3181. This entry was posted in Beauty, Beauty products and tagged Beauty, Beauty Products, Micellar Water by allaboutme31. Bookmark the permalink.